Surfrider is fed up with plastic pollution. It’s ugly and can impact wildlife that we love. Plastic pollution in the ocean typically starts as litter on the beach, streets or sidewalk. Sometimes there are more direct sources. 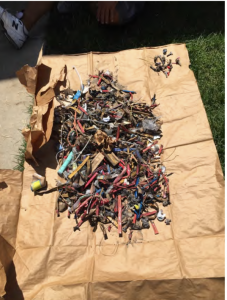 After discovering a new type of plastic litter on the beach last year, Surfrider volunteers traced it back to fireworks from the County Fair. We were happy to work with the Ventura County Fair Board and the fireworks company to use less plastic this year, improve clean up efforts, and we are all aiming for zero plastic litter next year. In August of 2015, a Surfrider member discovered small red and white plastic objects on the shore at C Street/Surfers’ Point (see photo A). It took a week or so to figure out that these plastic pieces were firework debris resulting from the Ventura County Fair fireworks shows that occur each evening of the fair. This info was sent out to our local Surfrider chapter and a few other members showed up to check out the situation and collected a significant amount of debris the morning after the last night of the Fair (see photo B). The fireworks vendor would remove all plastic bags and plastic components of the fireworks prior to launching them. The fireworks company would tie off the ignition wire, preventing the wire from flying loose with the shell as it launches. With the understanding that the above actions would be put in place, Surfrider volunteers surveyed the firework launch area and surrounding beach area each morning (8/4 through 8/16) of the 2016 Fair to assess the effectiveness of the agreed upon actions. There was very little debris observed the mornings of 8/4 through 8/6. The clean-up person and a volunteer were out each evening after the firework show cleaning up what debris they could in the dark and were out again each morning. They did a good job collecting firework debris at, and around, the launch site. However, on the morning of 8/7 we began to find white plastic pieces about 100 yards down (towards the pier) from the launch site all the way down to the pier. The white plastic pieces appeared to have washed up with the tide and were found mainly at the tide line, and most of them were caught up in kelp beds (see Photo C). The number of plastic pieces increased over the time period of 8/7 through 8/9. 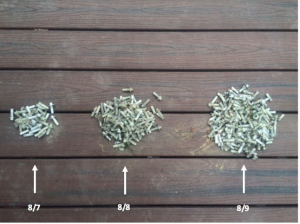 The amount of plastic pieces increased from ~ 30 pieces on 8/7 to ~ 125 on 8/8 to ~175 pieces on 8/9 (see Photo D). This debris was collected by 1 volunteer over a 1-hour period. The debris was of concern because it was plastic (non-biodegradable), can be confused with food by marine life, and appeared to be increasing in number over time. These findings were communicated via email to the fireworks company and the CEO of the Fair on August 9th. The fireworks company was quick to respond, identified the plastic pieces and suspected that a vendor of theirs had started to use these plastic pieces in place of what used to be a paper piece. They immediately extended their clean-up efforts the following morning and investigated the source of the plastic. 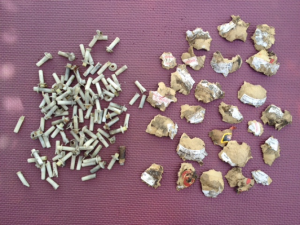 As a result, there was an immediate reduction in the number of plastic pieces found at the tide line the morning after the 8/9 correspondence as a result of clean-up efforts extending towards Ventura pier. These efforts continued through the end of the Fair as well as two days after the Fair ended and resulted in a major reduction of these plastic pieces being found at the tide line, in kelp, and in the rocks. However, because the plastic pieces went directly into the ocean, they continued to wash up further south over time. 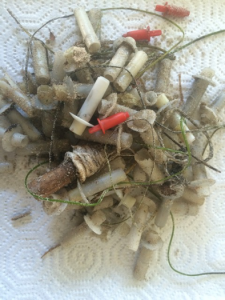 On August 16th, Surfrider received an email from a resident of Pierpont beach informing us that they had been finding plastic pieces (see Photo E) on the shoreline as far down as Dover jetty. Dover jetty is ~ 2 miles south of the launch site. Further, on November 17th, 7 pieces of plastic firework debris were collected at the tideline near Marina Park, ~ 1 mile down from the Dover jetty and ~3 miles from the launch site. 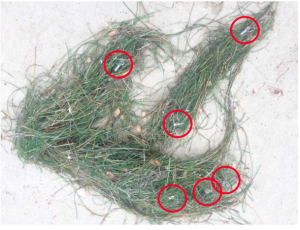 These findings stress the importance of ensuring the plastic components are eliminated from the fireworks as it is impossible to collect the plastic pieces that remain in the ocean and wash up to shore further south. utilize the clean-up standard that was established this year in following years. We will continue to monitor this issue and to work with the VCFB to protect our beaches and ocean.